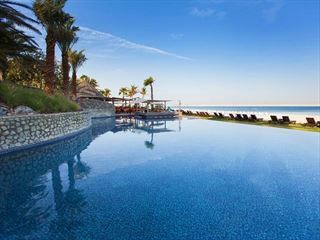 Miramar Al Aqua is located on the coast in front of the stark barren Hajaar mountains, on a beautiful sandy beach. The centre piece of this low rise Arab style hotel is the very large free form swimming pool, with lots of sunloungers and umbrellas. 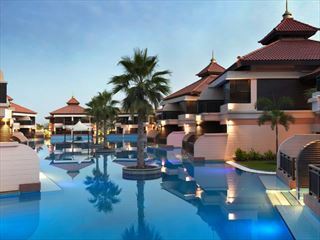 The luxury 5-star Miramar Beach Resort has spacious rooms and a range of bars and restaurants. The standard of food is very good with a good choice of restaurants. Iberotel Emirates Grand Hotel in Dubai is located near to the Dubai World Trade centre in the heart of the city and within walking distance of the Dubai Mall, the world’s largest shopping centre. This impressive 50 storey building offers a range of 409 luxury rooms and suites including fully equipped kitchens. The Gourmet Restaurant on the 46th floor offers oriental cuisine 24 hours a day. 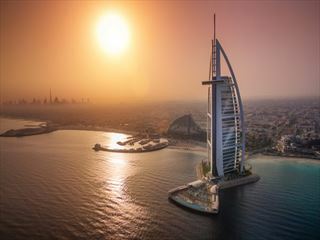 Guests can enjoy breathtaking views of the Dubai Skyline.